3D scanning technologies - what is 3D scanning and how does it work? 3D scanning is a technique used to capture the shape of an object using a 3D scanner. The result is a 3D file of the object which can be saved, edited, and even 3D printed. Many different 3D scanning technologies exist to 3D scan objects, environments, and people. Each 3D scanning technology comes with its own limitations, advantages, and costs. Some 3D scanners can simultaneously collect shape and color data. A 3D scanned color surface is called a texture. 3D scans are compatible with Computer Aided Design (CAD) software and also 3D printing, after a little preparation on the computer software. A 3D scan can give a lot of information about the design of an object, in a process called reverse engineering. 3D scanners are powerful tools for professionals in several industries, such as automotive, aeronautics, dental, jewelry, as well as video games, special effects, and animation movies. Laser triangulation 3D scanning technology, as illustrated on the image, projects a laser beam on a surface and measures the deformation of the laser ray. Structured light 3D scanning technology measures the deformation of a light pattern on a surface to 3D scan the shape of the surface. Contact-based 3D scanning technology relies on the sampling of several points on a surface, measured by the deformation of a probe. A 3D scanner in action (source: Artec). Laser pulse (also called time of flight) 3D scanning technology is based on the time of flight of a laser beam. The laser beam is projected on a surface and collected on a sensor. The time of travel of the laser between its emission and reception gives the surface’s geometrical information. Laser triangulation-based 3D scanners use either a laser line or a single laser point to scan across an object. The laser is first cast by the 3D scanner. As the laser light reflects off the 3D scanned object, its initial trajectory is modified and picked up by a sensor. From the modification of the laser trajectory and trigonometric triangulation, the system can discern a specific deviation angle. The calculated angle is directly linked to the distance from the object to the scanner. When the 3D scanner collects enough distances, it is capable of mapping the surface’s object and of creating a 3D scan. The main advantages 0f the laser triangulation technology for 3D scanning are its resolution and accuracy. One downside of the laser triangulation technology is its sensibility to the properties of the surface to 3D scan. Very shiny or transparent surfaces are particularly problematic. Structured light 3D scanners use trigonometric triangulation but do not rely on a laser. Instead, the structured light 3D scanning technology works with the projection of a series of linear patterns onto an object. The system is then capable to examine the edges of each line in the pattern and to calculate the distance from the scanner to the object’s surface. The structured light used for 3D scanning can be white or blue and generated by numerous types of projectors, such as Digital Light Processing (DLP) technology. The projected pattern is usually a series of light rays but can also be a randomized dot matrix. The main advantages of the structured light technology for 3D scanning are its speed, resolution and ability to 3D scan people. One downside of the structured light technology is its sensibility to lighting conditions and issues to work outside. Photogrammetry is the science of making measurements from photographs, especially for recovering the exact positions of surface points. Photogrammetry is based on a mix of computer vision and powerful computational geometry algorithms. The principle of photogrammetry is to analyze several photographs of a static subject, taken from different viewpoints, and to automatically detect pixels corresponding to a same physical point. The data input required from the user are the parameters of the camera such as focal length and lens distortion. This 3D scanning technology’s main challenge is to analyze many photos and thousands of points with high accuracy. A very powerful computer is required to run photogrammetry algorithms. The main advantages of photogrammetry 3D scanning technology are its precision and acquisition speed. Photogrammetric technology is also capable of reconstructing subjects of various scales, photographed from the ground or from the air. One downside of the photogrammetry technology is its sensitivity to the resolution of the input photographs and the time it takes to run the algorithms. Contact-based 3D scanning is also known as digitizing. 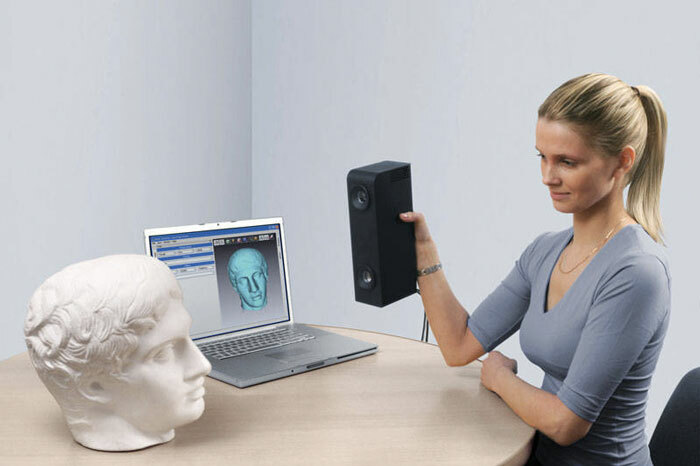 The contact technology for 3D scanning implies a contact based form of 3D data collection. Contact 3D scanners probe the subject through physical touch, while the object is firmly held in place. A touching probe is moved on the surface to various points of the object to record 3D information. The probe is sometimes attached to an articulated arm capable of collecting all its respective configurations and angles for more precision. Some specific configurations of contact-based 3D scanners are called Coordinated Measuring Machines (CMM). Contact 3D scanning is widely used for performing quality control of parts after fabrication or during maintenance operations. The main advantages 0f the contact technology for 3D scanning are its precision and ability to 3D scan transparent or reflective surfaces. The downsides of contact 3D scanning technology are its speed and inadequacy to work with organic, freeform shapes. The Laser pulse-based 3D scanners, also known as Time-of-Flight scanners or Lidar, measure how long a casted laser takes to hit an object and come back. Because the speed of light is exactly known, the time it takes for the laser to do the way back gives the exact distance between the 3D scanner and the object. In order to precisely measure the distance, the 3D scanner computes millions of laser pulses with picosecond (0.000000001 seconds!) accuracy. Since each measure only collects one point, the 3D scanner needs to cast its laser 360 degrees around that point. To perform this feature, the 3D scanner is usually fitted with a mirror which changes the orientation of the laser. Time-of-Flight 3D scanners encompass both laser pulse and phase shift lasers. Phase shift laser 3D scanners are a sub-category of laser pulse 3D scanners. In addition to pulsing the laser, the phase shift systems also modulate the power of the laser beam. The phase shift lasers offer a better overall performance. The main advantage of laser pulse 3D scanners is their ability to 3D scan very big objects and environments. They are, however, quite slow.